Check out the most updated and latest information about Arjun Kapoor's on the Internet.We have 63 videos of Arjun Kapoor including interviews, events, or public appearances.Arjun Kapoor has over 180 Fans registered on India-Forums.com. We have 384 Bollywood News articles related to Arjun Kapoor.Do share your criticism, comments and feedback for the Actor on Arjun Kapoor's comments page. We have over 99 Photos of Arjun Kapoor to view and download including Arjun Kapoor's Wallpapers. 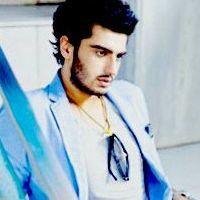 Love ya Arjun Kapoor !!! You and Sonakshi Sinha make a fabulous pair .. I love Arjun KApoor's 2 states movie, he did great work with Alia Bhatt. New Bollywood FF. Do visit if you like. You are a very good actor Arjun Kapoor. Keep up the good work! I'm head over heels in love wid u after watching 2 states! Love u Arjun Kapoor...all the very best for ur future movies sweetheart!! Arjun Kapoor. I'm love with you dear. Your acting in 2 states, is beyond awesomeness! Keep up your good work. God bless you!